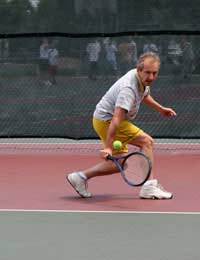 While tennis requires a certain level of fitness in order to be enjoyed to the full, this does not mean that it is the preserve of those for whom middle age is a long way in the future. In reality, some of the most committed and competitive players are those aged 40 and above, perhaps because they are making up for lost time having come to the sport at a relatively late age. Of course, the game can be enjoyed by older players simply for recreational pleasure, but there is a well organised and highly subscribed circuit that caters for those who want to pit their wits in a tournament environment. Don’t let that label “veterans” give you the wrong impression, either. There is definitely nothing genteel or leisurely about these match-play situations. In the United Kingdom, the Vets circuit is organised through Vets Tennis GB (www.vetstennisgb.org), which has around 200 clubs around the country on its books, all of whom are affiliated to the sport’s national governing body, the Lawn Tennis Association. Age groups are organised in five-year stages for men between 35 and 80, for women between 35 and 75. There are different categories of event, from those between clubs to inter-county and, finally, national standard. The goal for many players is to compete in one of the big tournaments, such as the British Open Veterans’ Indoor Championships, held at Brierley Hill in the West Midlands, the equivalent event on clay, which takes place at the West Hants Club in Bournemouth, or possible the ultimate, the grass court championships in August, the venue for which is Aorangi Park, at the home of the British game, Wimbledon. There are also international events, from the Four Nations that brings together the best from England, Scotland, Wales and Ireland to the senior tournaments featuring players from around the world and organised by the International Tennis Federation. Whatever your aim, whether it be to simply reach a good standard or, more ambitiously, to find yourself on court at an ITF event, the way to get started is to join a club. The Vets Tennis GB site includes a list of affiliated clubs and a link to the LTA club search facility (www.lta.org.uk/Search/FindAClub/) where contact details can be found for the one that is nearest your home. If you are lucky, there may be more than one in your immediate area. If so, visit each to look at the facilities and talk to the organisers. While it is not a necessity to pick the one closest to where you live, convenience may make the difference between getting in some much needed practice or putting it off because distance wins the day over determination. It is this determination that can go a long way to deciding how far you progress in the Vets game. Without a will to win, even the most talented exponents are not going to realise their potential. Don’t worry that you are going to find the club is the preserve of fit young people dashing about the court with ease. On the contrary, players of all ages, and all levels of ability, will be welcome. Take advantage of the coaching sessions and you may well be taking your first steps towards success on the Veterans circuit. Are Tennis Holidays Worth It?